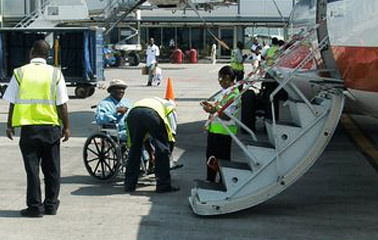 JCI is well prepared to meet your ground support and ramp service needs. As a valued customer, you benefit from JCI's proven reliability and attention to detail on the ramp. We take great care in delivering a safe and professional experience for your amp needs. 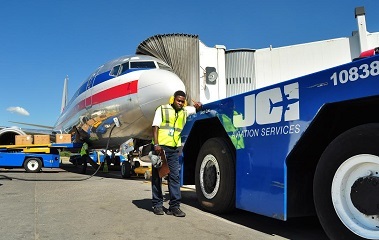 You will become part of a longstanding tradition of service that JCI has with many of the leading international and domestic carriers that fly to Haiti today. 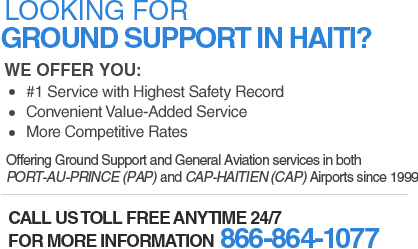 When you use JCI you receive the best in customer support and passenger service. You benefit from JCI's relentless focus on excellence and our outstanding reputation and cooperation with all airport authorities. The result is a safe and pleasurable experience for your passengers. JCI offers you reliable cargo services with meticulous attention to detail. JCI's experienced cargo team is highly trained and on your side acting as a liaison with state agencies and managing import and export documentation for your cargo. The JCI team is also skilled in handling dangerous goods, upholding all IATA Security Regulations and administering all cargo acceptance procedures for you. With our service you will see why JCI has earned the trust to handle cargo for some of the world's most reputable carriers. JCI goes the extra mile for you with value-added services and customized solutions for your general aviation needs. Such services include private charters, flight operations, and crew and aircraft support. JCI facilitates and enables vital communications between your airline and local third parties. Through its airline representation services, JCI assists you in more easily communicating with various local state agencies (including civil aviation, the airport authority - police, customs, and immigration) and private institutions. At JCI, we help you get the job done.